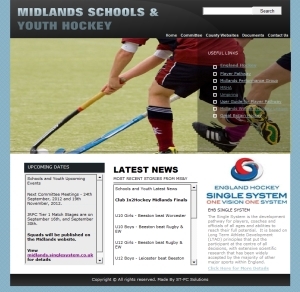 The Schools & Youth section of MRHA originated in September 2009 with the amalgamation of two separate associations, Midland Boys S&Y and Midland Girls S&Y, in order to ensure that boys and girls in the Midlands had access to similar opportunities, as well as streamlining the administration. The Midlands S&Y primary aim is to encourage the development of hockey playing, coaching and officiating within the Midlands. To this end counties are supported with the implementation of the Single System Player Pathway at JDC and JAC levels, in addition to providing opportunities for the development of young umpires. The development of players beyond county level is now the remit of the Midlands Region Junior Performance Group. The Midlands S&Y oversees and organises regional level competitions to allow teams to progress to EH national finals, in addition to some competitions which climax at Midlands Finals.